As you drive through the beautiful entrance off Miller Road you can see the lush green grass and mature trees that surrounds this welcoming community. 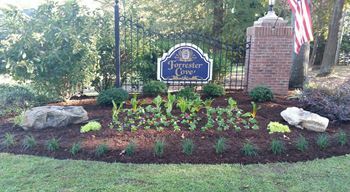 Forrester Cove consists of 50 homes, located in Greenville County, close to the City of Mauldin, and minutes from the shopping and dining on Woodruff Road. Please feel free to contact the HOA office for questions relating to the Association. For over 10 years, Chastine Property Management (CPM) has been providing exceptional property management services to serve both Homeowners Associations and owners of rental properties throughout the Upstate.